The summer conferences [for MMUF graduate students]...which started being held in 1993 proved to be the things that, more than anything else, got me through graduate school...I'm really good friends, to this day, with people I met [at the conferences]. Fellows at the SSRC's annual summer conference for MMUF graduate students. Who are the SSRC and Woodrow Wilson, and what do they do for MMUF? After graduating from college, MMUF fellows enter PhD programs at so many different graduate institutions that it would be impractical for the Mellon Foundation to funnel program support to them through their institutions, as the undergraduate MMUF program does. 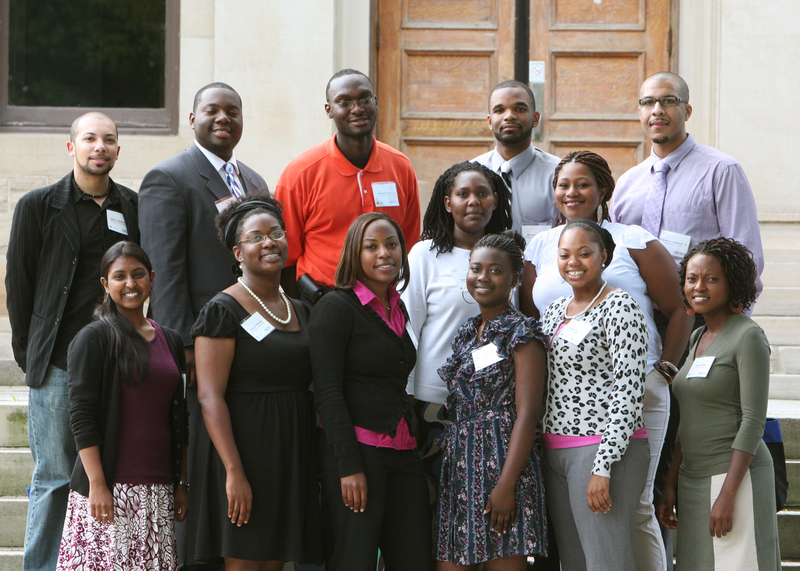 Instead, the Foundation provides graduate school support for MMUF fellows on a national level by awarding grants to two nonprofit organizations with long experience in administering academic programs: the Social Science Research Council, headquartered in Brooklyn, New York, and the Woodrow Wilson National Fellowship Foundation, headquartered in Princeton, New Jersey. With supervision from the MMUF staff, the SSRC and Woodrow Wilson then administer a broad array of events and grants designed to provide targeted support to fellows enrolled in eligible PhD programs and to those who have completed the doctorate. The MMUF program staffs at the SSRC and Woodrow Wilson thus fill roles in the lives of MMUF graduate students that are similar in some respects to the roles played during their undergraduate years by their campus coordinators. For a downloadable timeline of SSRC and Woodrow Wilson graduate events and grants, with eligibility details for each, please click below. Since its inception in 1993, the Graduate Student Summer Conference has been the flagship event of the MMUF-SSRC Graduate Initiatives program. Mellon fellows in their first through third years of graduate school, along with graduating seniors who have been accepted into qualifying PhD programs, are eligible to attend; fellows may attend the event twice during their years of eligibility. The conference provides a forum for skills exchange, cohort building, and the development of professional proficiencies such as delivering effective presentations and maximizing research support. The event exposes fellows to a broad range of institutional and intellectual issues and serves as a bridge between college and graduate school that strengthens fellows' dedication to pursuing a doctorate in one of the core arts and sciences, and supports their retention in the early graduate school years. For more than fifteen years, the conference has consistently proven itself to be an invaluable resource for early-stage graduate student fellows. Many past participants report gaining both a deep sense of renewal in their commitment to earning the PhD in the face of possible obstacles, and a scholarly community to which they may turn for support. The conference provides tools and skills for navigating the early years of graduate school, for negotiating institutional and departmental politics, utilizing research resources at the graduate level, optimizing summer research opportunities, and identifying and working with mentors. Panel presentations of fellows' research, thematic roundtables, presentations by senior scholars, and other activities are also a part of the conference program. MMUF fellows who have completed PhDs contribute to the conference by serving as workshop leaders, panel discussants and moderators. The conference takes advantage of the intergenerational nature of the Mellon community, providing opportunities for younger fellows to interact with senior scholars. Such informal networking is crucial for allowing fellows to build peer and professional relationships that will serve them for years to come. Building on the institutional strength of the SSRC as a pioneer in graduate student training, and on the mentoring component that distinguishes MMUF, the MMUF-SSRC Graduate Initiatives Program implemented a series of programs that target the specific needs of fellows as they progress toward the PhD. The first of these programs is the Proposal Writing and Dissertation Development Seminar (PWDDS), which strategically supports graduate students in their third through sixth years. The PWDDS offers fellows opportunities for intensive exchange and feedback on work at two critical stages of graduate training: firstly, during the proposal writing process when students focus on formulating intellectually sound proposals which lend themselves to completion in a reasonable time frame and are competitive in fellowship contests; and secondly, during the dissertation-writing process, when the quality of data organization, synthesis and analysis is most essential. The proposal-writing and dissertation tracks take place in parallel during the week-long seminar, and participants are selected through a competitive application process. Significant time is allotted for individual work, and fellows present their projects to their respective groups several times. Fellows find that this intensive seminar is an ideal setting in which to receive collegial critique and feedback. Each past participant reports making significant progress on the dissertation project as a result of the work completed during the PWDDS, with over 90% later reporting having successfully defended their proposals or completed their dissertations in a timely manner. The Graduate Writing Seminar (GWS) was developed specifically to advance the progress of fellows doing graduate studies in South African universities. Participants work on a range of graduate writing projects required for the South African course of study, engaging in peer review and consulting with Mellon PhD faculty. The structure and outcomes are parallel to those of the Proposal Writing and Dissertation Development Seminar held in the U.S. each March. Participants leave the seminar with concrete next steps to help them progress in their writing projects and move forward in their pursuit of the graduate degree. A significant number of dissertation writers in MMUF report having created informal writing clusters of two, three or four fellows who maintained a regular schedule of contact and provided one another with substantive feedback on work according to a mutually developed calendar. The MMUF-SSRC Graduate Initiatives Program seeks to make a similar support network available to each dissertation-stage fellow in the sixth graduate year and beyond. To that end, the SSRC has instituted Dissertation Writing Retreats to round out their step-by-step series of program offerings. Held each year on the campus of an MMUF institution and facilitated by a Mellon PhD, the Dissertation Writing Retreat (DWR) brings together 12 to 15 post-sixth-year graduate students for five days of intensive writing. Writing will be punctuated by structured time for each fellow to create an individual 12-month workplan with other Retreat participants. The primary feature of the workplan will be a structure for accountability to colleagues; participants will establish a calendar by which to exchange new or revised work by email and provide one another with feedback on progress. The DWR directly reflects best practices learned from fellows who successfully completed the dissertation after an extended ABD period. Unlike the Proposal Writing and Dissertation Development Seminar, the DWR focuses support specifically on fellows who face challenges requiring high levels of self-direction to overcome. The DWR offers support for the development of a structure for productivity with specific, self-defined marks of progress leading to dissertation completion. Eligibility will be based on the viability of completing the dissertation within a 12-month period as determined by a committee of senior scholars and SSRC staff. The Preparing for the Professoriate (PFP) Seminar is designed to give fellows who have completed, or are close to completing, the dissertation the set of skills they will need to transition from being young researchers to being successful negotiators of their first faculty appointments. Rather than focusing on the presentation and critique of fellows' academic work, this seminar hones the skills that fellows need to navigate the professional challenges they face in the years immediately following completing of the PhD. While the major emphasis is on preparing fellows for the academic job market, the PFP also includes information about postdoctoral fellowships and other opportunities. Mellon PhD faculty members from a wide cross-section of institutions facilitate the Seminar. In addition to practical issues, such as presentation of the CV and job talks, they discuss a variety of intangible issues, including defining one's academic identity, assessing the position you want and finding a proper fit, postdocs, interviewing, defining one's scholarship for the job market, and the "view from the search committee." Fellows get a level of attention far beyond what is offered by institutional workshops on the academic job market, and report being better prepared for the job search process because they've gained a sense of their individual next steps. The Predoctoral Research Grants offer modest supplementary financial assistance to Mellon fellows to help support the quality and timely completion of their doctoral work - particularly at benchmark moments in their graduate educations. Two predoctoral awards of up to $5000 are offered to fellows receiving fellowships and other institutional support during the second through fifth graduate years; a special award of up to $2,500 is available for fellows beyond the sixth graduate year who are writing the dissertation. We recommend that fellows carefully plan how they will use their grant opportunities, as they have been designed to allow maximum flexibility. Fellows should consider how to best allocate the available funds during their years of eligibility. The SSRC offers three types of predoctoral research grants: the Predoctoral Research Development (PRD) grant, the Graduate Studies Enhancement (GSE) grant, and the Dissertation Completion Grant (DCG). The PRD grant is available to second- through fifth-year students and is subject to a $3,000 maximum. (South African fellows are eligible for this grant in their first year.) It may be used for small-scale, preliminary research and other activities that support the early investigation of data sources, field sites, data sets and archival materials. The PRD may be received once per fellow. The GSE grant is available to second- through fifth-year students and is subject to a $1,500 annual maximum. (South African fellows are eligible for this grant in their first year.) It may be used to defer the cost of conference travel, equipment, books, journal subscriptions, and other necessary supplies. The GSE may be awarded to an individual fellow up to four times. The sum of PRD and GSE grants may not exceed $5,000. The DCG is a special award available to fellows in the seventh year of graduate study or beyond who receive little or no institutional support. The DCG is subject to a $2,500 maximum and may be received only once. Fellows must provide a timeline reflecting their plans to complete the dissertation within twelve months of the award date. The most important tenets of the MMUF program are mentoring and network-building. The MMUF-SSRC Lecture Series brings together undergraduates, coordinators, graduate students, and faculty in each region for intellectual engagement and community-building. Each talk gives a Mellon PhD the opportunity to share current research, while other attending fellows may capitalize on contact made at these events to build on their peer and professional networks and to continue to stay in communication with each other. A directory of all attendees is provided so that they may keep in touch with one another. The Lecture Series strengthens and sustains the Mellon Mays network, builds speakers' CVs, and showcases the work of Mellon fellows. To date, lectures have taken place in New York, Philadelphia, Chicago, San Francisco, Boston, Atlanta and southern California. The Mellon Mays Gap Assistance Program (GAP) is a set of post-baccalaureate resources and events for recently graduated MMUF fellows taking a gap year and preparing to apply to Mellon-approved doctoral programs in six or twelve months. It serves as a bridge between undergraduate college and graduate school. Graduate students, postdoctoral fellows, faculty and staff who are interested in contributing to the program as speakers, coaches, and mentors are encouraged to sign up as well. The MMUF-WW Travel and Research Grants, administered by the Woodrow Wilson National Fellowship Foundation, are available to MMUF fellows enrolled in qualifying PhD programs. The grants provide eligible graduate students with the financial means to complete their research prior to the start of dissertation writing. Funding is for one summer or semester of travel and/or research support. Awards are based on the scholarly merit of the individual applications received. The Travel and Research Grants provide up to $5,000 for a period of one summer or one semester. Grants may be used to cover dissertation research, travel to/from research sites, and photocopying of documents and/or the purchase of access to databases for research purposes. The award may not be used to purchase computer software or hardware, and may not be used for general living expenses. The MMUF-WW Dissertation Grants are available to MMUF fellows enrolled in eligible PhD programs. The grants provide graduate students at the critical ABD stage of their doctoral programs with support to spend a year finishing the writing of the dissertation. The dissertation grant offers up to $20,000 for a 12-month period. Fellows are encouraged to apply for dissertation grants from their home institutions. Winners who do not receive dissertation support from their own institutions are eligible to receive the full amount. The grant will be reduced by funding from other sources to ensure that each awardee receives a maximum award from all sources of $20,000. Woodrow Wilson will ask graduate schools to waive tuition for winners of the Dissertation Grant. Candidates must arrange for their own health insurance coverage. MMUF fellows who enter PhD programs in eligible fields are eligible for repayment of their undergraduate loan up to a maximum of $10,000. Only undergraduate debts accrued through Perkins, Stafford, Parent PLUS, or college loan programs qualify for repayment. Each undergraduate institution establishes its own procedure for facilitating the loan repayment process and record keeping; thus, fellows requesting loan repayment should contact the MMUF coordinator at their undergraduate institution to initiate the process. Each undergraduate coordinator works directly with their institution's undergraduate financial aid offices to disburse repayment funds. Generally, MMUF institutions require fellows to participate in an exit interview, during which time the undergraduate coordinators can familiarize student with their campus' loan repayment procedures and provide them with the necessary information to apply for repayment. For each of the first four years of full-time enrollment in a qualifying PhD program, the Mellon Foundation, through fellows' undergraduate institutions, will repay one-eighth (up to $1,250) of fellows' undergraduate debts; thus, if students pursue full-time graduate study for four years, they will receive $5,000. When fellows complete the doctorate, they will qualify for an additional $5,000 payment, which must be requested within three years after their receipt of the PhD. Fellows are required to submit a loan deferment form and verify graduate enrollment when requesting payments. If a fellow has undergraduate debt totaling less than $10,000, the remaining balance of loan repayment funds may be used to repay graduate loans. Graduate loans may only be repaid upon completion of the PhD. The total amount of loan repayment funds may not exceed $10,000 and may only be used toward designated educational loans from recognized lenders for graduate study. Loan repayment and other continuing benefits of the MMUF program are available only to those fellows who enroll in PhD programs in eligible fields within 39 months of graduating from college. (Terminal master's programs are not eligible for loan repayment.) Fellows entering eligible PhD programs after being out of college longer than 39 months may write to the Associate Director of MMUF to be considered for continuing benefits on a case-by-case basis.